Love & Sugar Kisses: Say Cheers for Minnie Mouse! Say Cheers for Minnie Mouse! My beautiful baby turned 2 this January. She is gorgeous and full of love & life. And she is also full of opinions...lots of them. She is in fact, the most opinionated 2 year old I have ever met (disregard the fact that I haven't met that many). But when it was time to plan her birthday party, I figured I would choose the theme. After all she's TWO...like she really cares as long as it's a party, right? Originally this was going to be a two tiered cake, with this being the top tier. But, my baby has the misfortune of having her birthday in the middle of flu season. 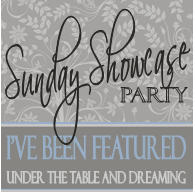 By the time we got through a round of it, we had to reschedule the party and ended up with less guests than we had originally planned as it seemed everyone we knew was sick. Another tier would have balanced out the cake more...plus I just love the look of a tiered cake. In retrospect I should have made the 2nd tier anyway...but I was working with a post-flu brain myself. The mouse ears were really fun to make. 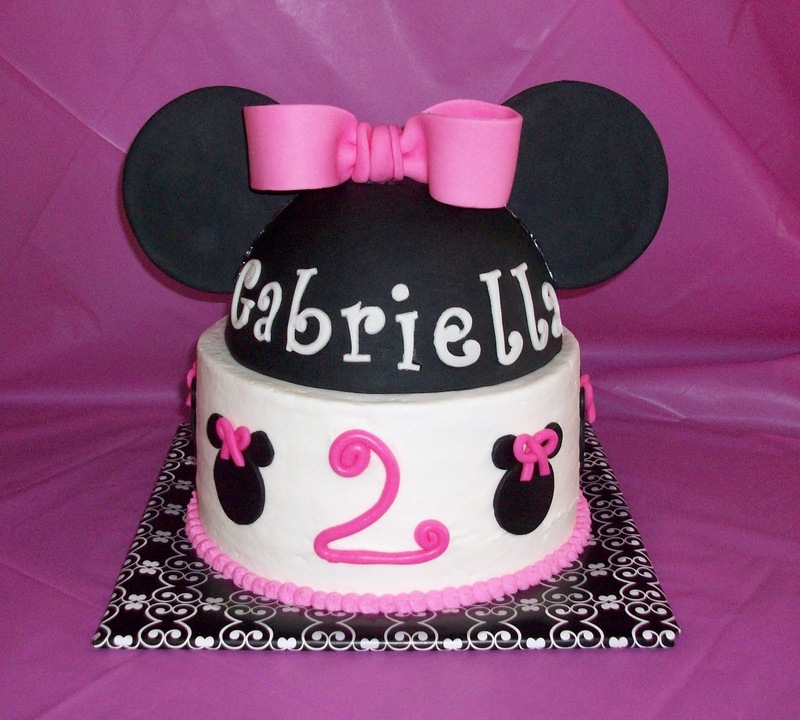 The entire hat is made from fondant. I used Satin Ice fondant instead of my usual homemade marshmallow fondant because I think black fondant is hard to achieve at home. I made the hat about a week before the party in order to give it time to dry. I used a very thin plastic bowl as the mold for the hat and cut out the ears with a cookie cutter. After everything had dried completely (a few days) I used candy melts to attach the ears! 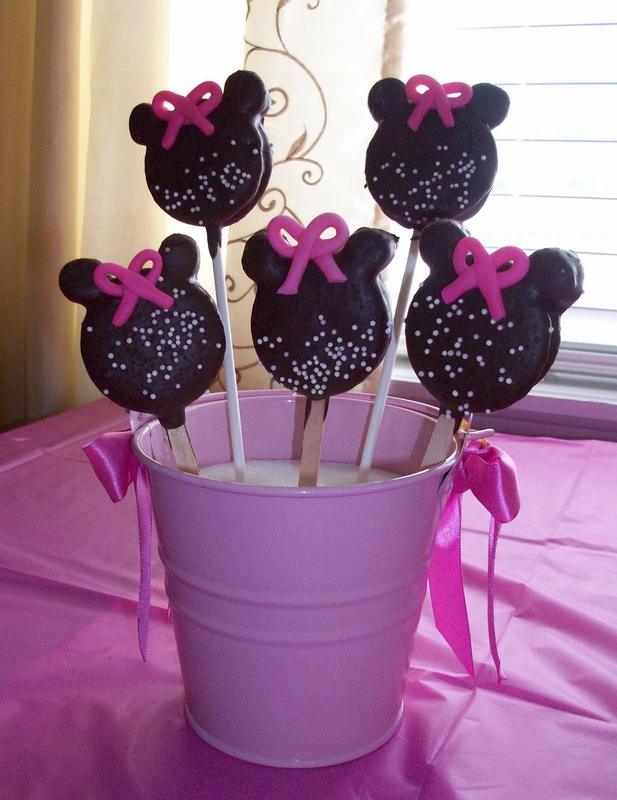 Another fun party treat that I was so excited to make was Minnie Mouse Oreo pops! These were adorable and yummy! Check out my tutorial here on how to make these pops! 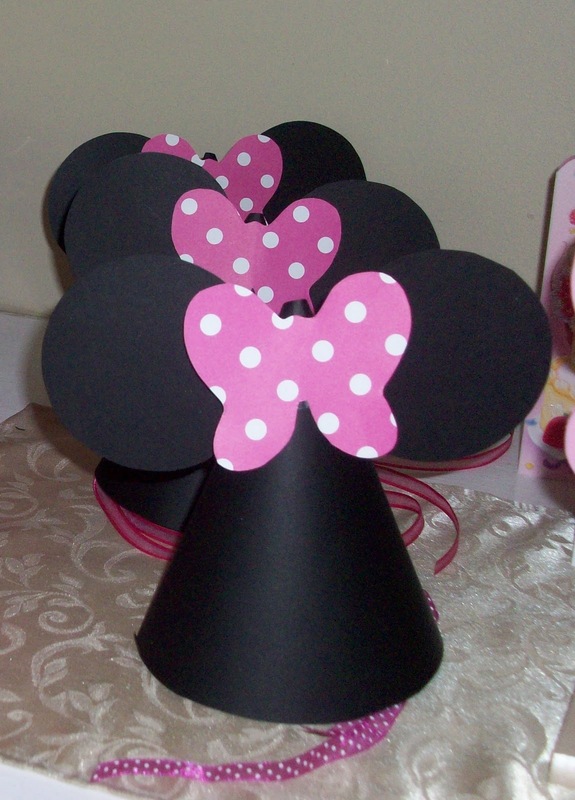 And I couldn't have a Minnie Mouse party without providing some adorable ears for everyone. I made these out of cardstock adding a ribbon for the tie. Super easy and super cute (my kids are still playing with these)! You can read the tutorial on how to make them HERE. The party favor boxes were purchased from Walmart, filled with Minnie & Friends stickers, bubbles, and some m-n-ms (pink of course). 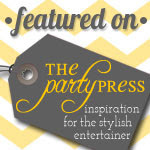 I dressed them up with some ribbon and thank you tags from Get the Party Started on Etsy. Oh and speaking of the candy...it pays to plan ahead! Buying a specific colored m-n-m bag of candy can get pricey! But they always put out colors for the holidays. Lucky me, all the Valentines Day candy was available in January so I was able to pick up several bags for the party. Of course the bags were mixed with red, white, & pink. And I just needed pink so....yep, I sorted through those bags and just picked out the pink ones! Still way cheaper than buying them the other way! Door hanger also from Get the Party Started. 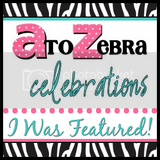 Birthday banner purchased from Roxy156789. 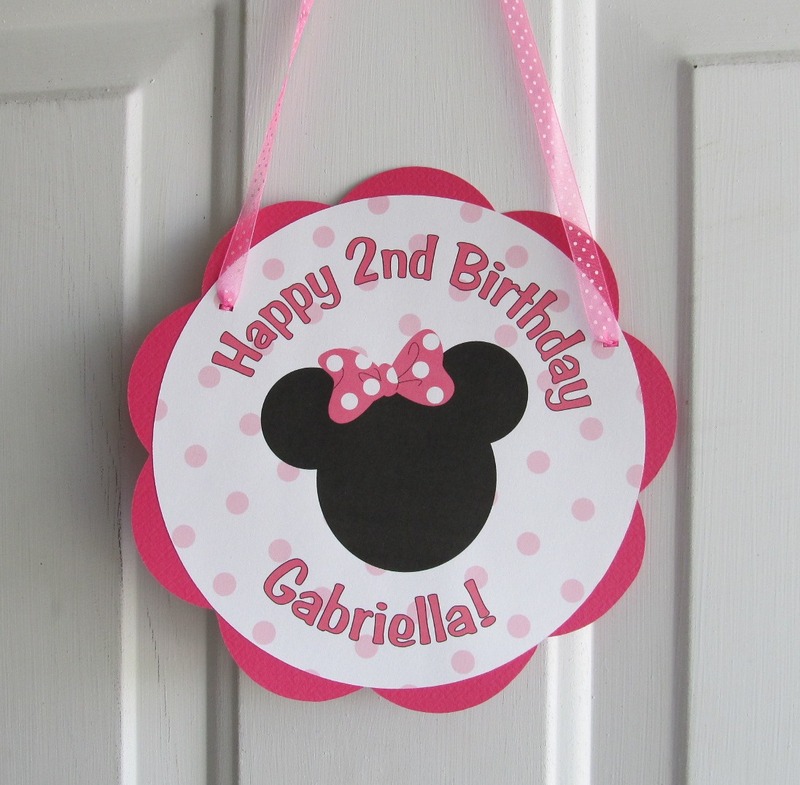 The birthday girl fell in love with her beautiful Minnie Mouse dress (and she asks to wear this regularly)! 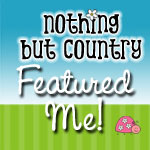 This was another Etsy purchase from Fun UpTown Girls. One very happy birthday girl! Super Cheers! Everything is just too cute. Do you have a tutorial for the cake? I would love to know how to make it. 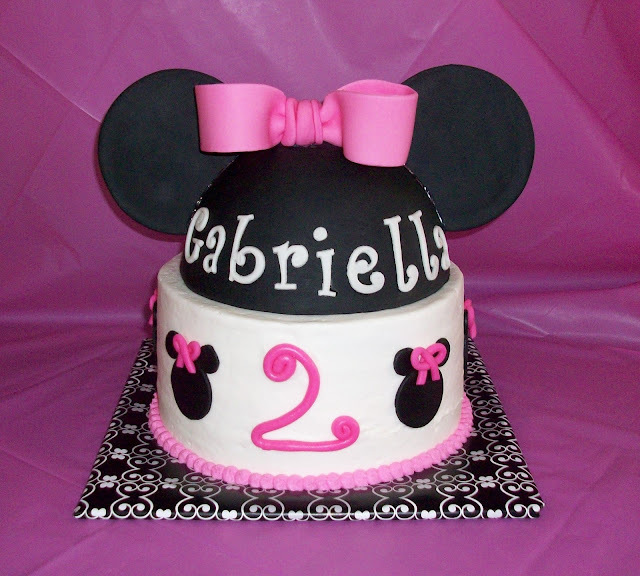 Hi Kayla, I don't have a tutorial for the cake because I made it before I had the blog LOL! But this is a popular theme so I think I might have to do a tutorial on the mouse ears :) Thanks for the idea!! Aw bummer. :) I will check back to see if you make a tutorial. In the meantime could you tell me more about how to make the mouse ears and cake. I'm on a budget so if I can pull the cake off that would be soo great. :o) This would be my first time working with fondoant. What cake mix did you use? I'm just wondering. I went to your photo stream and saw that you used butter cream frosting did you make that? If so what is the recipe? I don't use a mix, my cake is a scratch vanilla cake. I will try to post a tutorial in the future, but I have a number of projects in the works so I'm not sure when it will be. 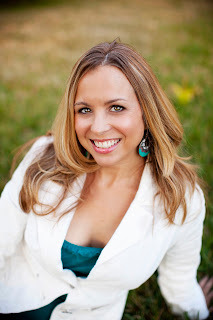 Please send me an email to maria@loveandsugarkisses.com and I can give you more info. Mama's got a brand new toy!